We are suckers for historical ruins. The more remote and character-filled, the more we love them. In Portugal, the Moorish Castle in Sintra captured our heart. While in Guatemala, it was the ruins of Tikal that had us lost in a time long since past. 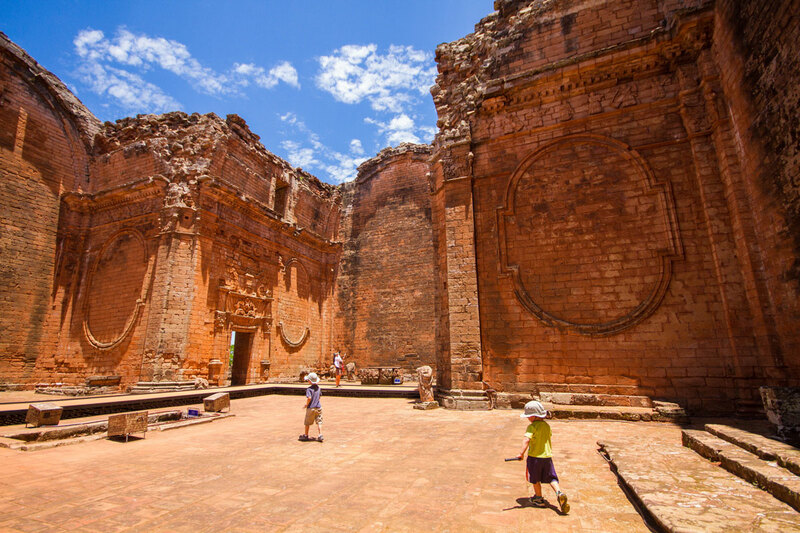 In South America, it was the Jesuit Missions in Paraguay that took us on a journey through time. 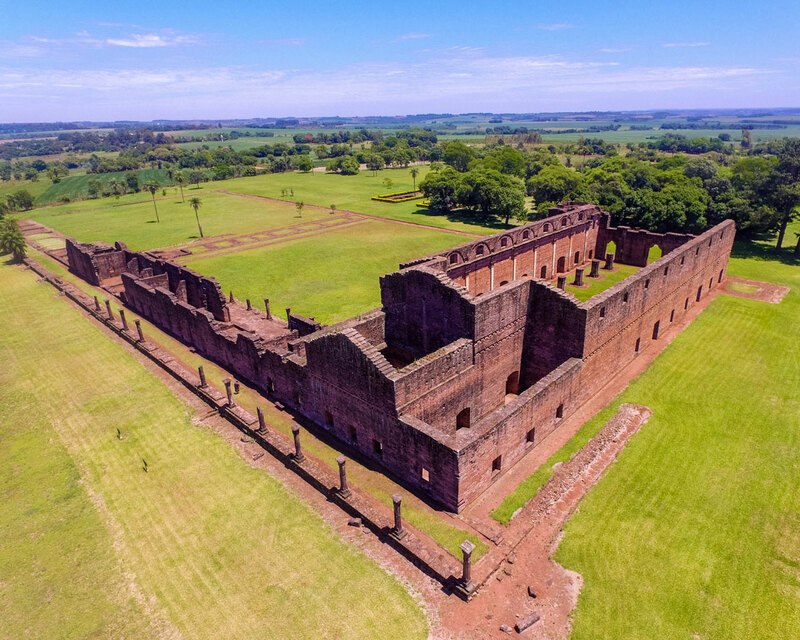 We were based in San Ignacio, Argentina for a few days and, being so close to the border, we got in touch with Michael, a San Ignacio tourism operator regarding getting into Paraguay to see the ruins. We can’t resist an opportunity to get another stamp in our passports! In the morning, the incredible Jimmy the Aussie picked us up. He is an Australian expat of Argentinian roots. He built up an instant rapport with the boys and our group chatted amiably during the drive to the border. Jimmy regaled us with stories of his adventures and as we pulled up to the border station for the ferry to Paraguay, he hopped out to take care of the paperwork for us. We boarded a small 18-car ferry and sat on the open upper deck to take in the views. 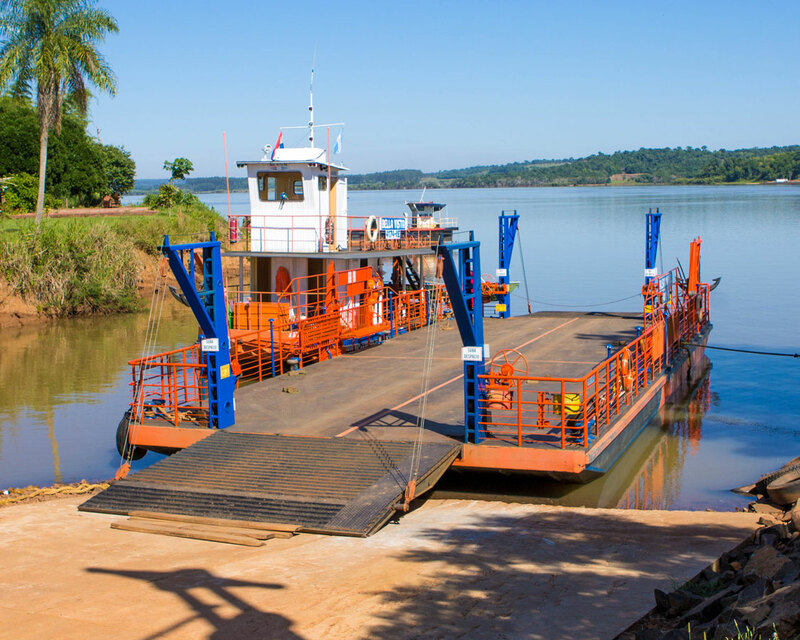 The boys watched excitedly as we made the short crossing of the Parana river towards the border of Paraguay. Once we docked, the cars were unloaded and the paperwork handled for the visas on the Paraguay side. The ferry runs almost hourly. Pro-Tip: There are regular bus services from Posadas in Argentina to the Misiones Department in Paraguay. Just request to stop within walking distance of the ruins. 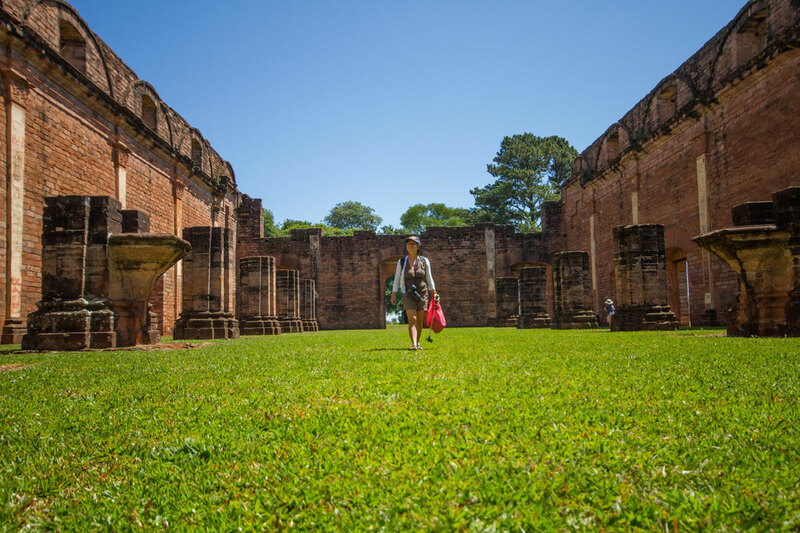 After just under an hour on the road, passing through small towns and beautiful countryside, we pulled up to the first of the Jesuit Missions in Paraguay, Mission de Jesus de Tavarrangue. 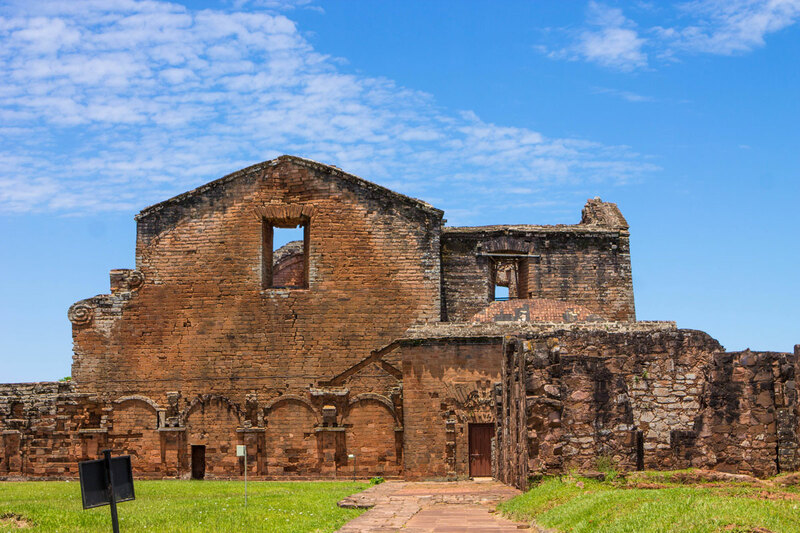 The Mission of Jesus got its name as it was to be the largest of all the missions in the Misiones Department. Designed to be a replica of the Sanctuary of Loyola, in Spain. The mission is accessed by walking from the main entrance near a small museum with a miniature replica of the completed buildings. Jimmy and I had chatted about my fascination with the local custom of drinking Jerba Matte and spoke with one of the staff at the entrance who was kind enough to share his drink with me before we made our way onto the grounds. As we crossed through a small grove of trees, the entrance to the missions church came into view and the boys took off running, excited to explore the grounds. 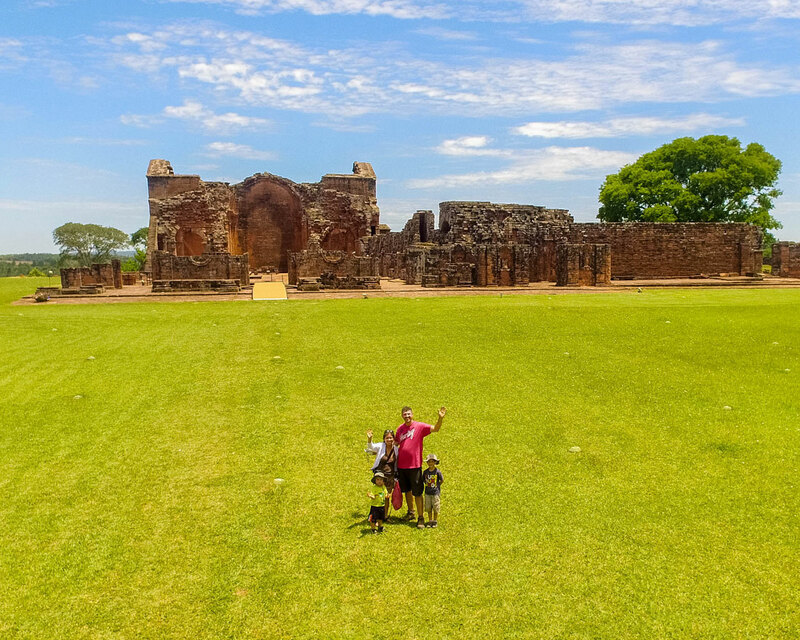 Pro-Tip: The missions in Paraguay sit in wide open fields with very little shade. Make sure to lather up with sunscreen and bring plenty of water to keep hydrated. The Reduccion de Jesus was founded back in 1685, but the current location was settled in 1760. The mission was never completed, and the Jesuits were expelled from Paraguay in 1767 by Brazilian invasions leading up to the Paraguayan War. During the active time of the mission, a unique balance formed between the natives and the Jesuits. Whether that balance was of greater benefit to the natives is up for debate, but there is no doubt that a loyalty existed between the two factions, with two Jesuits leading a village of thousands of natives. The mission itself is incredibly easy to explore. With wide-open expanses and well-trimmed grass to roll around on, they are a perfect playground for kids. The boys slalomed around the pillars of the Reduccion de Jesus (Jesus’ Mission). The church would have been one of the biggest churches of the time at over 70M long and 24M wide! We also took the chance to let the boys scratch their photography itch. We love to let them take control of the cameras to see what kind of wild and fun angles they’ll come up with. 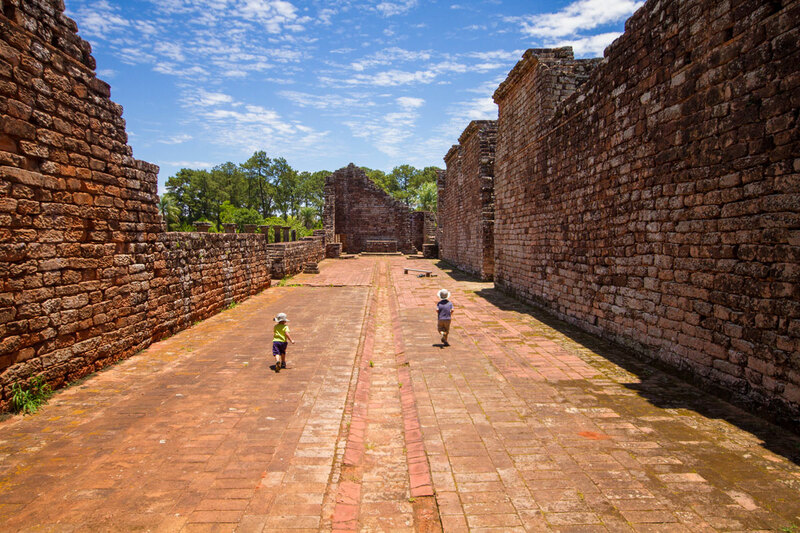 While the ruins of Jesus de Tavarrangue were pristine due to their relatively young age, the ruins La Santisima Trinidad de Parana were a treasure chest of discovery. These ruins were far more complete, and the grounds far more expansive. 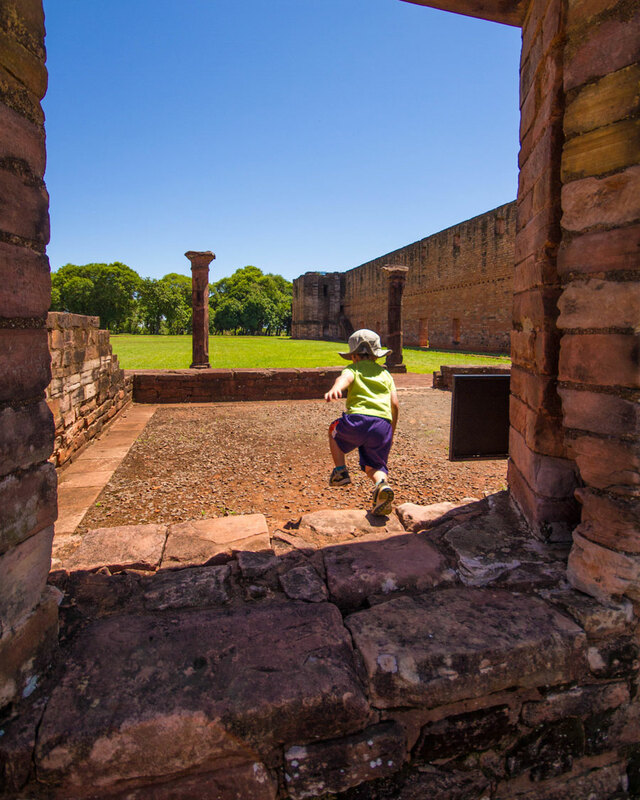 La Santisima Trinidad de Parana offered a complete picture that these missions were designed to be self-contained societies, existing with their own rules outside of normal colonial life. Originally built in 1706, the mission has a meeting plaza, two churches, a school, workshops and more. It is the more established of the two ruins, but, like Jesus de Tavarrangue, the Jesuits were expelled from the area in 1768. The ruins of Trinidad are a treat to explore. Because the ruins are far more complete than the ruins of Jesus de Tavarrangue, it deserves a lot more time as well. The watchtower that serves as sentry over the village is a great starting point. While you can’t enter it, it is easy to imagine the views from its peak. Nearby is the original church that served as the place of worship for the mission until the population grew past its ability to contain them all. The boys loved racing along the length of the building. As we made our way towards the main cathedral, we strolled through the various workshops where the natives would build and forge the items needed to run the mission, including the massive bells that sat in the towers of the cathedral. There is also a section that contains many of the archaeological finds from the ruins, including statues, facades and the thigh tiles used for the roofs of the structures. We learned that they were called “thigh tiles” because the clay pieces were actually shaped by being bent over the thighs of the workers. 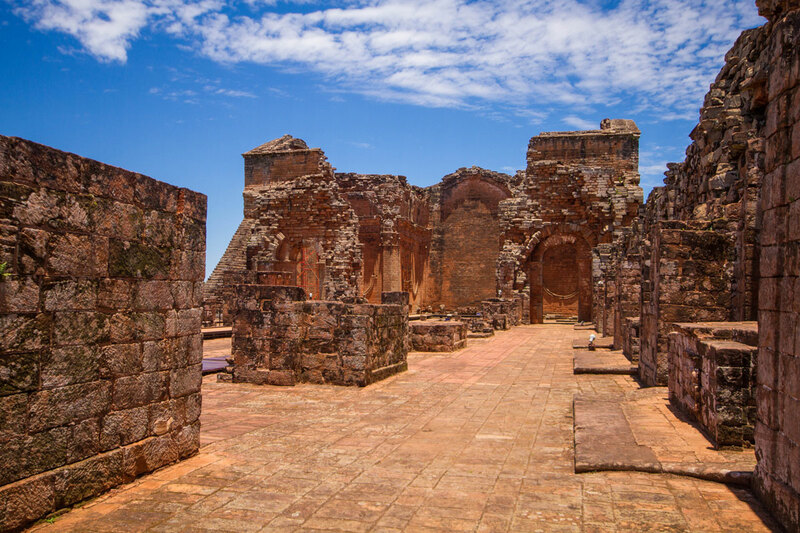 The Cathedral in the Missions of La Santísima Trinidad de Paraná is nothing short of breathtaking. While not as large as that in Jesus de Tavarrangue, it has so much more in terms of artistry. The tall walls still feature delicate arches, and even the remains of some of the statues can be seen mounted near the walls. The statues are all missing their heads, which were decapitated during the expulsion of the Jesuits and the ransacking of the missions. We had to remind the boys not to walk down the middle of the cathedral. 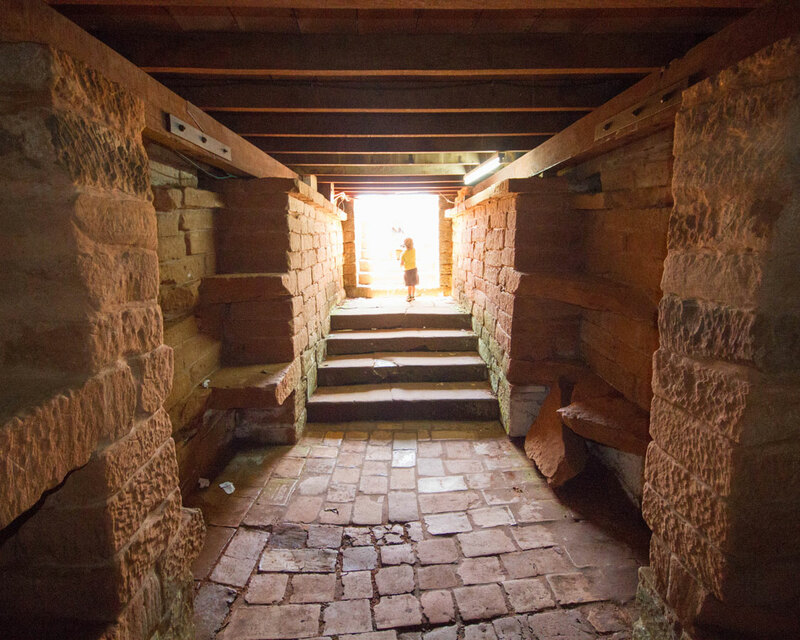 The floors were lined with the crypts of the remains of the village chiefs buried beneath the stone floors. There is also the remains of a crypt beneath the sacristy, however, it has long since been emptied. Visiting the two missions in Paraguay made for an incredible day trip from San Ignacio, Argentina. San Ignacio is known for its own incredible Jesuit Mission, San Ignacio Mini. But it may leave you wanting more, so it’s great that these are so close by. 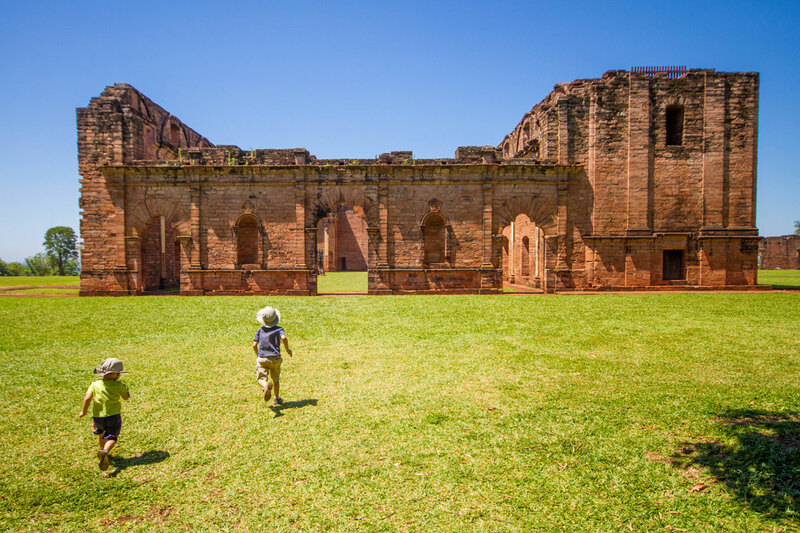 While the beautiful weather helped, the history and stress-free sight-seeing in Paraguay made for a truly unforgettable experience. The region is largely untouched. 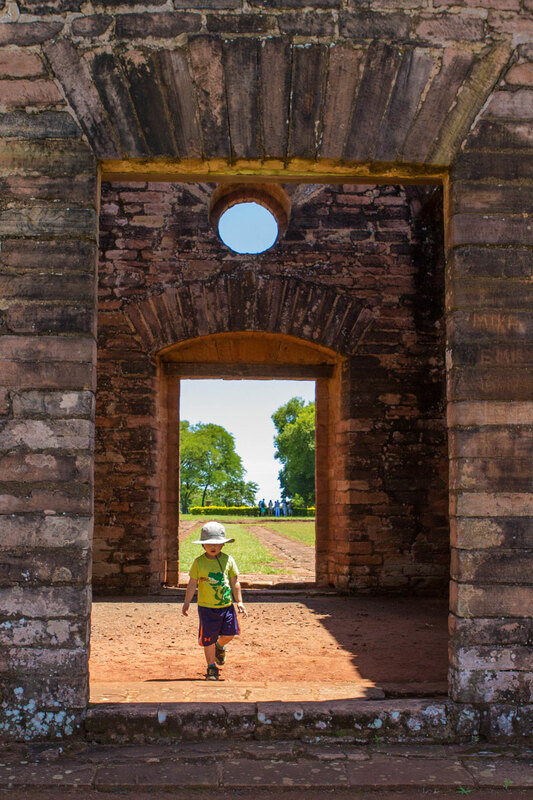 The boys were able to explore the ruins exactly how they love to, by touching, climbing, smelling and seeing everything that they wanted to. If you are in the region, it is well worth the time to visit for yourself. As we met back up with Jimmy for our return to Argentina, our conversation drifted back towards Matte and how everyone in the area seems to drink it religiously. 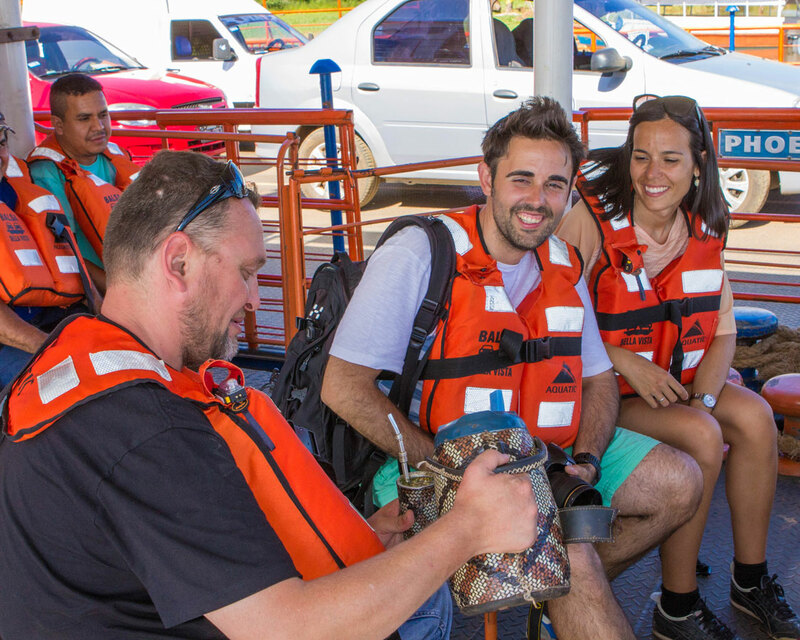 We were lucky enough to meet up with a friendly crowd on the ferry ride across the Parana river and before long, the group of us were sharing a drink of this delicious tea and discussing all the incredible things we had seen that day. Great video of the ruins! The grounds are quite large and so well maintained. The red stones are so pretty. The archaeological finds section looks interesting, I would probably spend most of my time in there learning all about the roof tiles. What interesting ruins. Totally unlike others you’d expect to find. Makes sense with the revolution and such. I love the cool and unusual places you guys explore! Love to find like minded people! We always travel with the kids, too, and I blog about making it educational. These ruins look like something we would seek out, too! The perfect venue for kids to explore and learn and not worry about ‘being quiet’. LOL! 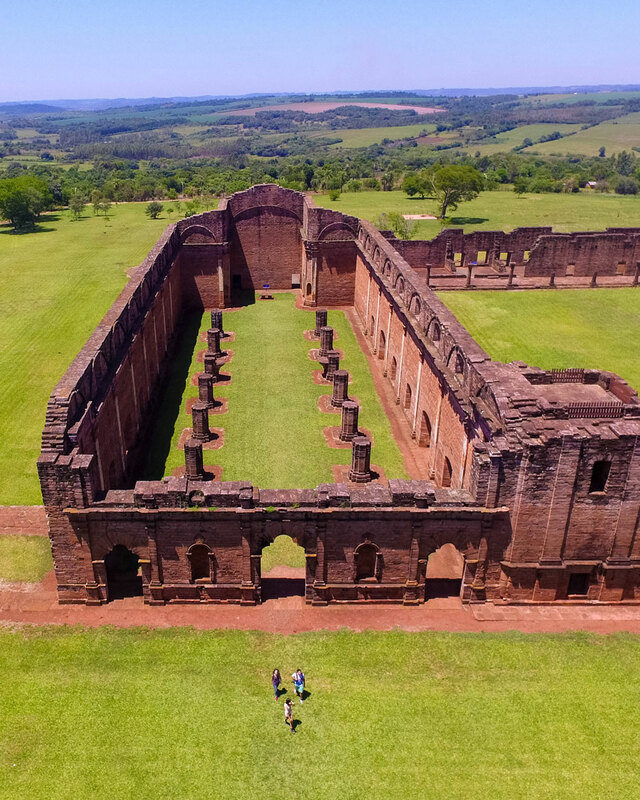 I never think about visiting paraguay but these Jesuit ruins look super cool. And who knee you could get there from Argentina. Love the info here and I bet I would have as much fun exploring this place as the kids. Thanks! Love the post, but I’m just so distracted by the aerial video of the ruins! Wow! It’s funny how much more spectacular things can look from the air. I do love ruins though, no matter what perspective I have of them! The ruins look really cool especially from above. Its so awesome that your kids are getting to experience this part of history as well ( and do some photography on the side! ) Sure they will be adventurers when they grow up as well. Wow, these missions are perfect for photography. The clear sky, greenery and coloured buildings. I can imagine how the kids loved running around them. It’s great how you can see all these on a day trip from San Ignacio. I loved Tikal, too. These ruins look fascinating, and bonus that you got to take a little car ferry. Getting there is half the adventure. 🙂 Cool that the kids could climb and touch and run around outside. For my boys, that makes all the difference. Putting this on our list of places to go. I can’t resist getting a new stamp in my passport either so when I was visiting Chile this year I had to step into Argentina for a few days to get a new stamp in my passport (and drink some Malbec straight from its home). The ruins of Trinidad are amazing! I love how well the ruins of the entire city have been kept over the passing of the years. The Cathedral is indeed majestic! I also love the fact that you seem to have been almost alone there. This is how I like to explore places myself, when there are no other tourists around. This looks like a fantastic place to explore! I know my 5 year old wold have a blast. As a photographer, I’d love to go just to photograph everything. What a fun trip! Looks and sounds so interesting. 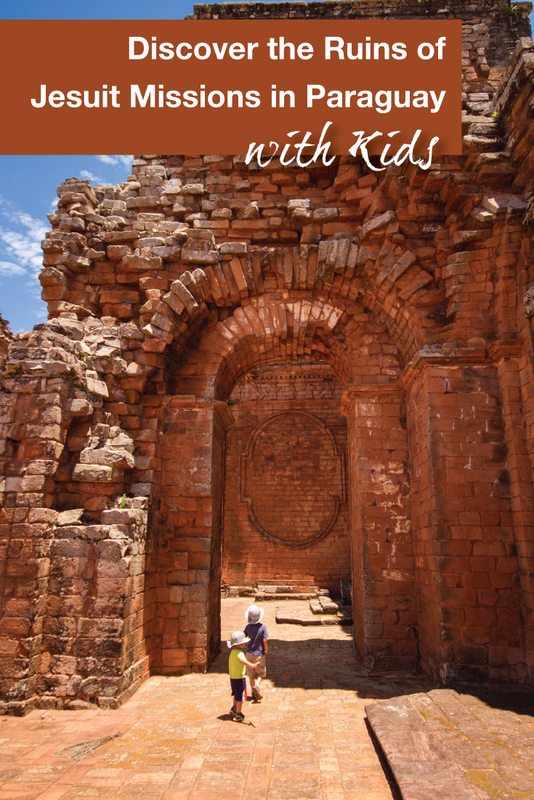 We have added this to our Paraguay must see list!!! What a fun place to visit especially for kids! The photos look great and hope I can visit soon! These ruins are fabulous. I can’t get over how manicured the landscapes are surrounding them. 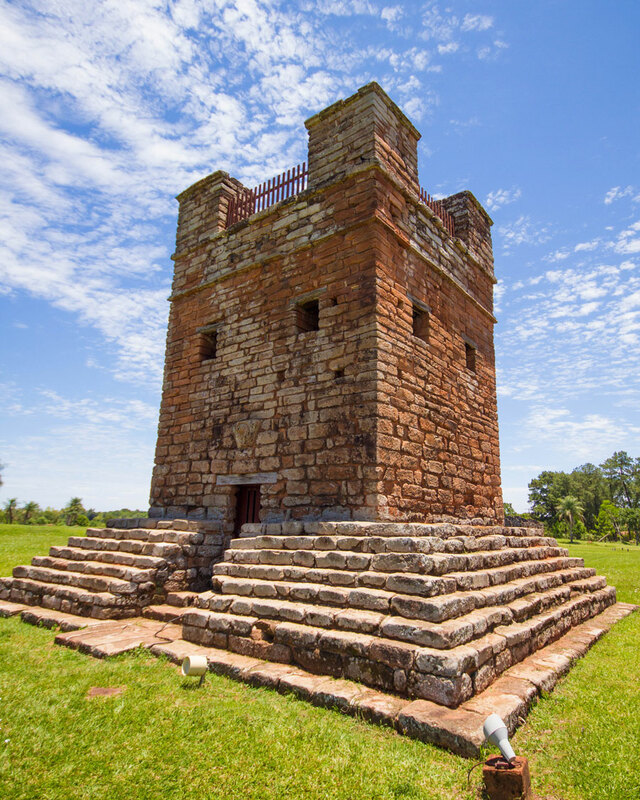 the Paraguay government must truly take pride in their historic sites. I have longed to head to South America and visit these nations. 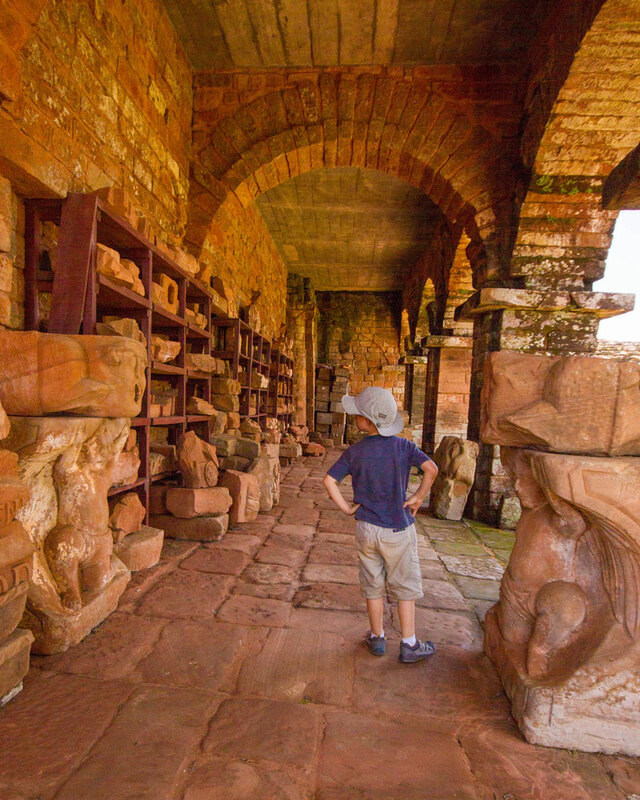 I never would have considered Paraguay other than to visit my dad’s sponsored child, but these ruins show there is quite a lot to see there. Absolutely amazing views of the ruins. I will be in Paraguay in a couple of months and was wondering about places to visit whilst there. This undoubtedly goes into my list. Love the ruins. Wonderful to have an exotic place to run, touch and explore for your boys. We are also crazy about ruins and history. It is lovely to learn the history, then sit with the kids and imagine what it would have been like 🙂 Thanks for the great post. We considered long and hard about visiting Paraguay, however for Australians there is a ridiculous $160US reciprocity fee (I blame our government, not theirs), so we baulked with that cost. 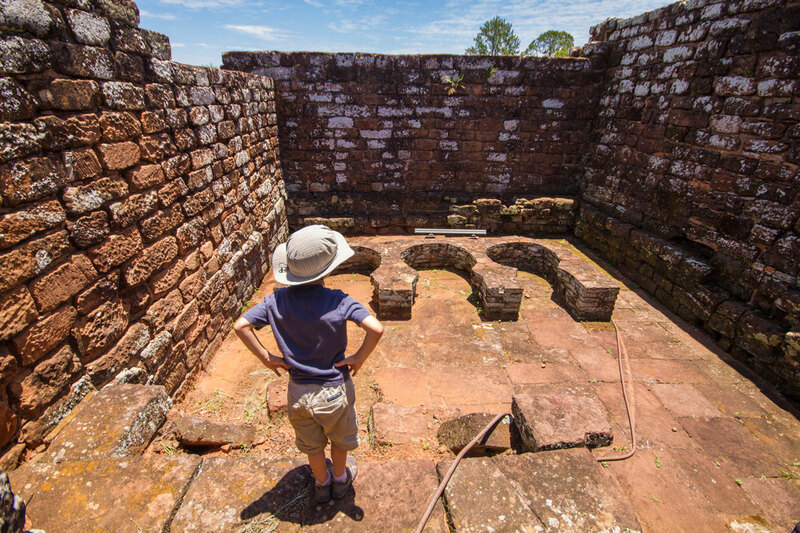 The Jesuit missions were one of the things we’d have definitely loved to see! 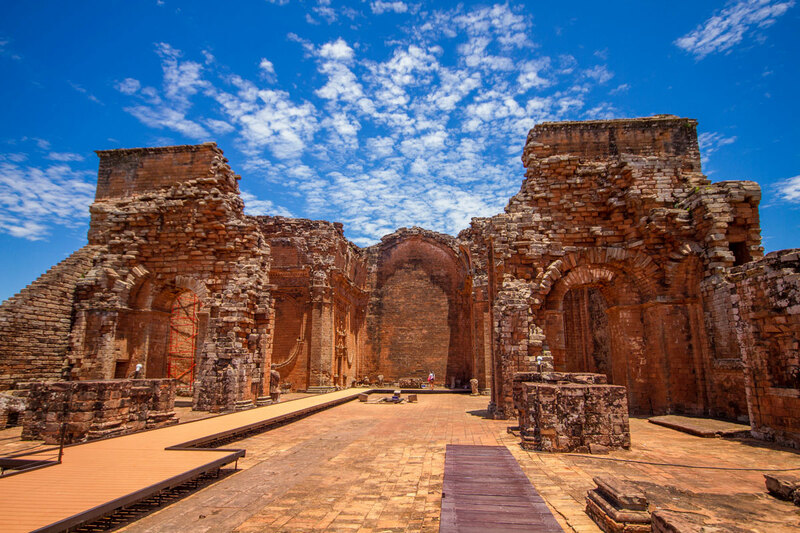 I’d love to visit Paraguay and the ruins, they look fascinating. Incredible that the roof tiles were made on men’s thighs! It must have been a real adventure for the boys, taking a boat, exploring the ruins and sharing the tea on the bus home – what a fabulous day. Wow. I’m ashamed to say I didn’t know any of these existed. I love wandering around ruins, always so much fun to let the imagination run wild. I’m sure the children could come up with lots of stories. Thanks for teaching me something new today. It’s an easy place to overlook, but if you can get there, it’s definitely worth the visit. Thank you so much! It’s gorgeous there and in pristine care. 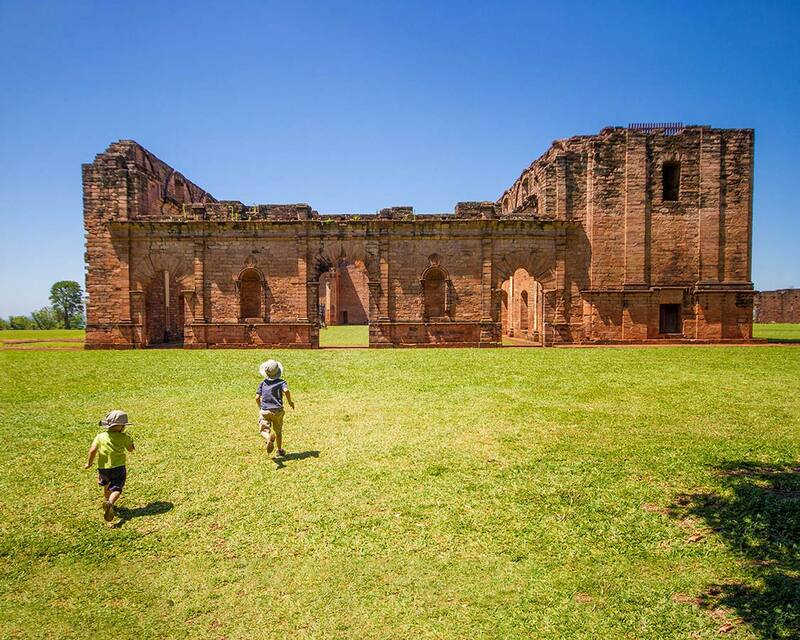 Paraguay often gets overlooked. This place has true scenic beauty. I strongly believe that ruins have a beauty of their own and the same applies here. Every architecture is so unique. Love the history behind this place. I love exploring historical ruins, and they always photograph so well! Your photos look stunning and I hope I can see this for myself in Paraguay someday! Yes when I went to these ruins I thought they were great also. They are in perfect condition and there are no crowds or hassle! It is such a treat to visit a place that hasn’t been discovered by the masses yet, isn’t it!